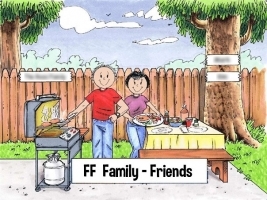 Personalized Friendly Folks cartoon caricature gifts for the whole family - and all of your friends, neighbors and co-workers too! Printed Perfection offers 600+ Friendly Folks scenes, all personalized. Available in a several gift items, including a snow globe, snow frame, key chain, memo pad holder, mail sorter, refrigerator magnet, Christmas tree ornament and more! Some of the best features of our Friendly Folks gifts are that they are fully personalized, ship fast, and are perfect for everyone, even the person that is hard-to-buy for - almost all items are under $25! 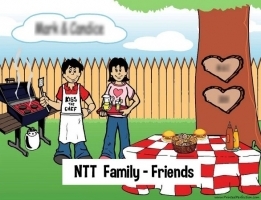 We now offer a second line of caricature scenes - Please click on the pictures below to shop our Friendly Folks (FF) or Name That Toon (NTT) lines. When applicable we have included a cross reference link within each product listing, so you can easily browse between each line.